Greg Kessler pitched five good innings for North Idaho College, but the bottom fell out in the sixth, according to The Spokane Spokesman-Review. By the time the inning was over, the 4 to 1 Northern Idaho lead turned into a tie, a performance hampered by defensive mistakes, according to The Spokesman-Review. A "pitcher can't be expected to make five outs in an inning," Kessler coach Jack Bloxom told The Spokesman-Review after the eventual North Idaho loss. Kessler eventually pitched well enough to catch the eye of the Cubs, taken by Chicago in the 27th round of the previous June's draft. Kessler, though, didn't sign immediately, according to The Spokane Chronicle, waiting through spring 1989, and more college ball, before committing to the pros. Kessler's extra time in college ultimately couldn't get him a long career as a pro. His pro career lasted just two seasons, Kessler not getting past short-season ball. At North Idaho in 1989, Kessler went 11-6 in that extra season, finally signing with the Cubs at the end of May, according to The Chronicle. 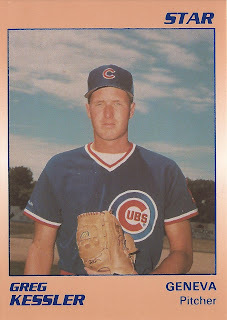 With the Cubs, Kessler played his first season at rookie Wytheville. There, Kessler got into 13 games, 11 starts. He went 3-7, with a 6.00 ERA. He also threw two complete games. For 1990, what turned out to be Kessler's final season, Kessler moved to short-season Geneva. At Geneva, Kessler got into 18 games, eight starts. He went 2-4, with a better 2.74 ERA. But those 18 games with Geneva were his last as a pro, Kessler's career ending with a 5-11 record and an overall 4.42 ERA.